One of the places I was most looking forward to fishing while in Montana was the Ruby River. I decided on fishing the part of the Ruby that was within state owned lands because it seemed that the complicated and controversial river access in Montana was basically centered around a single Ruby River landowner, and I didn't feel like running into trouble. Plus I liked the idea of a relatively small stream with lots of small eager fish. I drove the hour and a half or so from Dillon, a good bit of it via dirt roads, but hey, I had a rental car so I didn't let that slow me down. On the way to the Cottonwood campground, I passed a sign warning visitors about bears, and an ever increasing part of me wished I hadn't decided against buying bear spray at a hefty 34.95 a can. In short order I found a turnout, rigged up my Superfine Glass 3 weight with Royal Wulff and started casting to rising fish mere feet from the car. I missed a few strikes, then hooked a fiesty little cutthroat, my first ever. I wet-waded my upriver through beautiful scenery, wide gravel bars, and undercut banks. I passed numerous bones of large animals, reminding me to whistle loudly as I moved through the brush to bypass more difficult sections of river. I hooked and landed a powerful rainbow of around 12 inches, followed by my first mountain whitefish. A few feet further upstream, a deep and relatively calm pool was regularly disturbed by rising fish, but they displayed no interest in my Wulff and Pheasant Tail dropper. I switched to something a little smaller to match the tiny mayflies they were feeding on and landed a nice grayling on the first cast. Visibly different than the European grayling, the North American grayling seems to have a smaller dorsal fin in addition to the spots along the body. 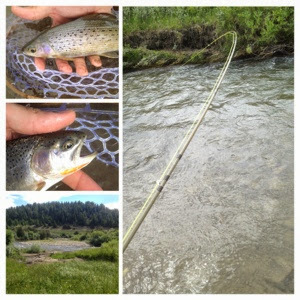 I saw down, enjoyed an energy bar and some water for lunch, and fished my way back the car, still nursing a sore back. Back at the campground, I treated myself to a luxurious dinner of a ham sandwich, a shower, and some sleep.